This week, I have a special guest column from Eric of FantasyLoot.com, who will discuss who to select and who to avoid in your daily fantasy lineups. In Week 5, we’re going to take a different approach than we have in past weeks. As usual, we’ll only discuss higher priced players, but I’m going to give you the guys I’m confident will have a big week. In past weeks, I also included a list of players that cost more than $8,000 that I wouldn’t touch that week. However, this week, I don’t see that many players over that threshold that I absolutely hate. With that said, let’s look as some players you should be all in on this week on FanDuel. Remember, these are the studs that you can feel confident inserting in your lineup this week. I’m not considering sleepers or lower priced players in this column. 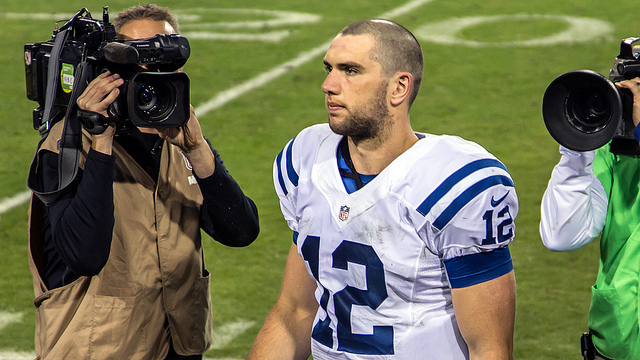 Andrew Luck $10,000 – He is going to cost you a pretty penny, but he’s worth it. You can feel confident when you have Luck at the top of your lineup. A friend of mine this week asked me what I thought Luck’s fantasy future would hold. His new normal is 300 plus yards and three-four touchdowns per week, while Luck roughly averaged 250 yards and two touchdowns a game in his first two years. I strongly believe the current Andrew Luck is here to stay. Giovani Bernard $8,800 – Did you see how bad the Patriots run defense was last week? Bernard should have a field day this week and break off some long runs. If he doesn’t find the end zone, I’ll be surprised. If I had to pick one of the three highest priced running backs on Fanduel this week (Marshawn Lynch, DeMarco Murray, and Bernard), I’d go Bernard, despite how well the other two have been playing. Le’Veon Bell $8,600 – As much as I like Bernard, I may like Bell more. I think the Pittsburgh Steelers‘ gameplan will be to pound the ball against the Jacksonville Jaguars, and Bell will benefit big time! Even if the Steelers decide to throw the ball early, it will be Bell who will grind out the game down the stretch. I think he’ll see his season high in touches so far, which currently stands at 27. Antonio Brown $9,000 – I could call it a typical Jaguars’ fade week, but it’s more than that. Brown has been the best fantasy receiver this season, and you can’t ignore the matchup this week. While I think the Steelers will favor the run, Big Ben will throw the ball, and Brown will be the recipient of the big plays and red zone looks. Continue to ride Brown’s hot streak. Julio Jones $8,800 – Matt Ryan has been spreading the ball around, but Jones is still his favorite target. I don’t think he’ll have any problems approaching 100 yards with at least a touchdown this week. With Calvin Johnson’s injury woes, Jones is the only receiver priced over $8,000 that I feel confident with this week, obviously other than Brown. If you can find the right balance of the players above and a few sleepers, you should find yourself doing very well this week. You can see my Week 5 Fanduel Sleepers here.